The ocean is hiding a big secret. And in the new arcade Monster Fishing Legends, you’ll be trying to reel in the big one. To help capture some unique and interesting sea creatures, you’ll need to have a great sense of timing and land bait in the correct area to help lure the monsters. There are a number of different levels where you’ll try to land the big one. While the one-touch gameplay is easy to pick up and learn, getting the bait to correct spot definitely takes some practice. When you land the bait closer to the correct spot, you can earn more coins. 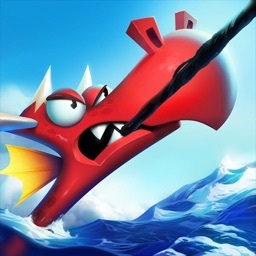 Monster Fishing Legends is designed for the iPhone and all iPad models. It can be downloaded now on the App Store for free. There are a number of in-app purchases available. In the fun arcade game, you can lure and reel in unique sea monsters.